It's definitely a bargain, but the multi-mode filter makes this stand out from the crowd. Multi-mode filter. Fat sub oscillators. LFO can be used as an oscillator. Filter cutoff and LFO use the same MIDI CC number. The folk behind MFB seem to be on a tear in 2010, with an ever-expanding range of analogue synths, modules, filters, drum machines and sequencer boxes. Perhaps the resurgence of interest in modular synths has influenced the design of these new synth boxes, as they are sporting more patch points and routing options for integrating units together. The Nanozwerg is the baby of the bunch. Identifiable by its bright yellow top plate, it's housed in a hand-sized plastic project case. MFB's no-frills build quality gets the job done without dazzling you, but the saving is definitely reflected in its price, balancing its overall value. Inside you'll find a single oscillator with a pair of switches offering a choice of four waveforms over four octaves. Sounds can be modified through PWM and VCO modulation, both of which use the LFO as the source. This can be reinforced by a choice of half or quarter divide-down sub oscillators, a mix of both or plain old noise. Alternately the audio input can be mixed in, so it can also be used as a stand-alone filter box. Speaking of which, finally someone has included a multi-mode filter in a mini synth and this one feature is enough to set it apart from the competition. If, like us, you find the low-pass filter just doesn't give you enough scope for sound design, then the four modes on offer here will whet your appetite, and add to the overall value of the deal. The 12dB design is capable of both fat and squelchy tones and offers low, high, band and notch flavours. The gentler cutoff slope keeps the sound harmonically rich and satisfying and the resonance can be dialled right up to self-oscillation. You can hear the filter by itself by turning off the sub oscillator and setting the VCO mixer dial to the sub position. The filter fits three modulation sources into two rotary controllers. The Contour knob uses the ADSR as its source, and can be shaped in both positive and negative directions with the middle point turning modulation off. The other knob offers an either/or selection between VCO and LFO as mod sources with depth at zero on the centre point. The LFO is quite interesting because it offers a few useable extras. There are a couple of patch points for the LFO, an input to modulate the speed, plus an output. This is interesting because it can be routed back in through the audio input, as it also goes well into audio rate. It can also be used in one-shot mode. While the design manages to squeeze a lot out of the limited feature set, we found there is a problem with one. Namely the way it uses MIDI CC#1/Modulation for both the filter cutoff and the LFO speed without giving you the option to choose between them. This might only affect the MIDI guys, but it makes more sense to allocate a separate MIDI CC number for each one. The internal sequencer is more of a utility than a creative feature. There are four simple presets, which can be transposed using MIDI/CV and the speed is set using the LFO dial while holding the one shot button, but it doesn't affect the LFO speed. One of the presets simply keeps the gate open which can be handy for when you want to process external audio through the filter without having to trigger it. For the price and the features, MFB have created a bargain analogue synth with additional features usually seen on more expensive units, to seal the deal. 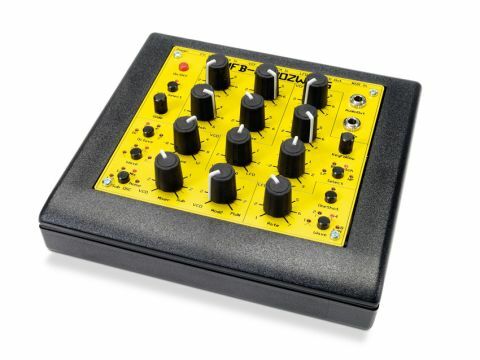 A serious contender in a crowded mini mono synth market.